When Di’neke was small, I took her to Kimiad on a Sunday where there was a little wooden jungle gym that was hidden away in a lush patch of natural bushveld riverine forest under false pretenses that there are Fairies there and if she was very quiet, she might just see one. Thank goodness for the “Fairybutterflies”, else this little toddler would never have allowed me a few quiet moments to scope out the local bird life! Hahaha! Little did I know that this year, I would indeed stumble into a Fairy at almost the exact same spot! Well, not quite one wearing a little tutu and carrying a magic wand in her hand… but one that catches and eats little flying insects. Yup, a Fairy Flycatcher. Of course I had to share it with Di’neke now about 10 years later and little impressed she was with me when I told her about how I bull-twanged her back then as we walked up to the spot. Hahaha! She gave me a little smirk when I pointed out the Fairy to her. “Cute” she said, “but not as cute as the ones I thought I would see back then as a 4 year old!”. Cute it is! The Fairy Flycatcher is Southern Africa’s smallest endemic bird, weighing a measly little 6 grams. It is an altitudinal migrant to the highveld during winter, but where exactly they come from is still some sort of a mystery. It is believed that it could be from Lesotho or even as far as the Karoo and even the Tankwa National Park. A mighty traveling feat for such a small bird. Pretoria is about just as far north as they will go, but there are records of it as far north as almost reaching Polokwane. In Pretoria they seasonally occur during winter at various localities, like Moreleta Kloof Nature Reserve, Voortrekker monument and the Pretoria Botanical Gardens. 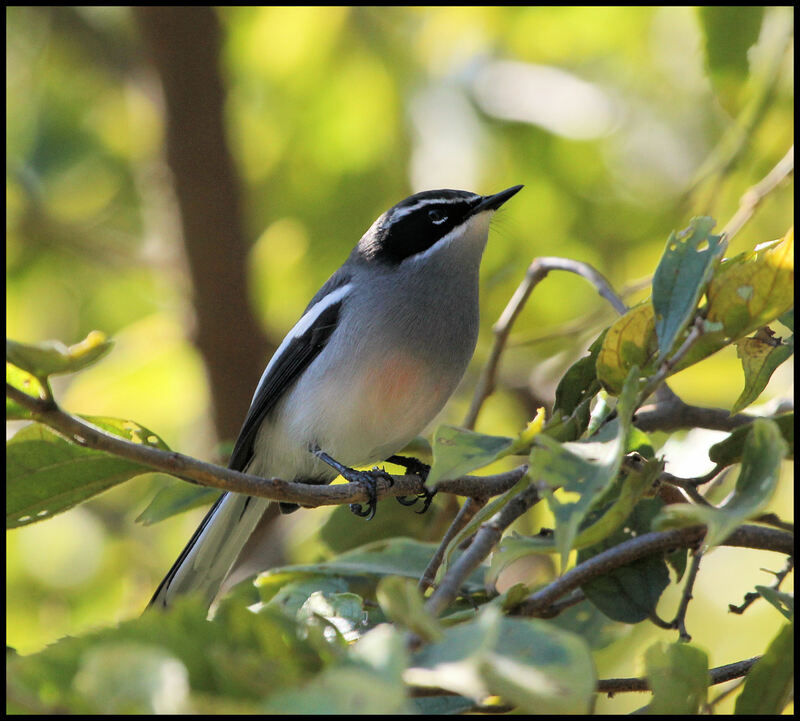 Finding them is not easy and one needs to be very familiar with its calls, especially the contact call which sounds very much like the familiar “pshising” sound birders make to lure out inconspicuous birds. Once you are onto one, you better make sure your neck is in good working order and you have to be fast, I mean real fast (Like Laine when she snapped this one above)! These little Grey, Black and White with a little wash of pink (nearer to the breeding season) bolts flashes around like little turbo-charged… well… fairies! Seeing one is one thing, but getting a photo of a Fairy is almost damn near impossible as it just about never sits still! Fairy Flycatchers are splendid little birds. Neat as a pin and as cute as those fairies with their tutus and wands Peter Pan used to mingle with. So who knows… maybe one day when you silently traverse a well suited patch of kloof bush or a clump of thorn trees and you are quiet as mouse, you may just have a glimpse of one of Pretoria’s Fairies.